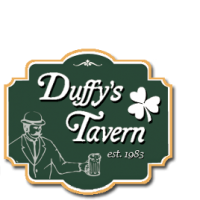 Nestled in the shoreline community of West Haven, Connecticut, is a quaint little gem called Duffy’s Tavern. Upon entering the establishment, you are immediately taken captive by its warm atmosphere and immaculately clean interior. Rich oak antiques enhance the character of the restaurant, evoking an ambience of an old time speakeasy coupled with authentic Irish décor. As you settle into a booth, it’s easy to become entranced with your surroundings. Photographs of sports legends, local pride, and historic events overcome you with feelings of nostalgia as aromas of our freshly prepared entrées make your mouth water. The menus are extensive, offering a variety of “comfort foods” as well as gourmet cuisine. The entrées are exceptional, and the service is friendly and attentive. Duffy’s has attracted loyal patrons throughout and beyond the state of Connecticut since 1983. It’s a place where new couples meet and old friends gather. Faces are always familiar, and visits are always memorable. Whether it’s for a delicious meal or a relaxing cocktail, you are sure to return again and again. Experience Duffy’s Tavern.